Often breathtaking in their poignancy, the stories in Vanessa Blakeslee’s Train Shots feature characters aching for emotional connections they rarely achieve. Deeply flawed and selfish, these characters sometimes behave wretchedly. Yet, it’s not meant as a criticism to say that they’re monstrously self-involved. After all, loneliness can powerfully motivate those obsessed with their own emotional well-being. Blakeslee is drawn to such characters but not because she wants us to level judgments or forgive their defects. She wants us to see into them, not for sympathy’s sake exactly, but for the sake of knowing the lived experience of others. Readers may come to judge selfish characters less harshly, but we’re not encouraged to excuse their faults. The collection’s best stories (such as “Train Shots,” “Welcome, Lost Dogs,” and “Barbecue Rabbit”) make us feel their deep ache for companionship, for someone to share all their burdens. Their lives are terrifying, confused, haunted by sorrow, and—due to nothing more than chance—could easily be our own lives. Lest it seem the stories are relentlessly bleak, it should be said that characters in Train Shots are chock-full of compelling idiosyncrasy. Blakeslee displays canny accuracy in characterizing details, specifically in using the images her characters perceive and contemplate. In the title story, P.T.—a train engineer—wanders around Winter Park, Florida, after running over yet another person, his third in four months. Passing a homeless man, P.T. recalls his second victim, a “bum outside Jacksonville . 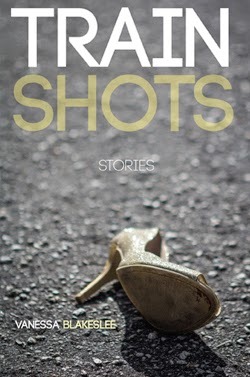 . . in drab, loose clothing,” who’d faced down the train and let it run him over. P.T. had been unable to look away because he “wanted to see if the bum would flinch or not.” The victim “raised both arms wide and lifted his chin as if to welcome home a god,” and P.T. noticed “the tilt of the man’s thick glasses on his face,” the man’s balding head “shining through matted gray hair,” and “the tape binding the seams of his coat.” Here, with Blakeslee’s characteristic verve and economy, the images’ progression dramatizes P.T.’s morbid fascination changing to humane pity. Reviewer bio: Alex DeBonis’s work appears in The Ilanot Review, decomP, Esquire.com, American Book Review, and Small Press Book Review. Though his roots are in the Midwest, he teaches fiction writing, literature, and composition in West Tennessee, where he lives with his family.